Qudian's business outlook is murky, and its share price is down roughly 80% over the past year. Qudian Inc. (NYSE:QD) stock lost 23.2% in August, according to data from S&P Global Market Intelligence. Shares fell after the company's second-quarter earnings release on Aug. 24 arrived with news that a partnership with Ant Financial's Alipay wouldn't be renewed beyond the month. Qudian is a Chinese fintech company that specializes in small loans, typically aimed at younger adults or those who might not otherwise have access to credit, and the loss of one of its most important sources of new borrowers is a major setback. 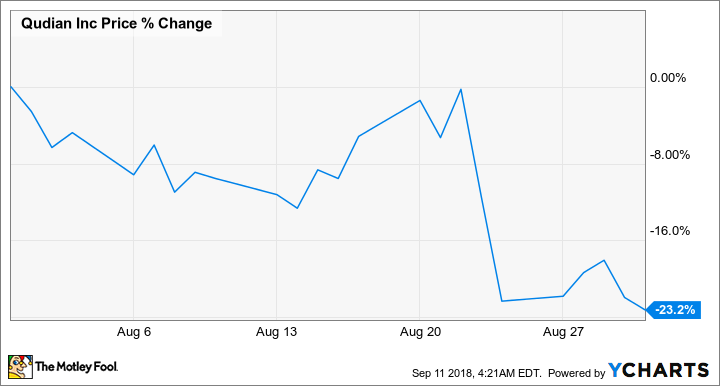 The big sell-offs occurred as the company's adjusted earnings per American depository share for the quarter came in at $0.34 -- $0.10 above the average analyst estimate. As fellow Motley Fool contributor Jordan Wathen recently pointed out, Alipay was responsible for bringing in somewhere in the neighborhood of 30% of Qudian's new borrowers. That's a big hole to fill, and the development looks even more worrying in light of indicators from Qudian's recent earnings report. The company's number of active borrowers, defined as borrowers who have drawn down credit, declined because of tighter lending policies, dropping from 5.6 million borrowers at the end of June 2017 to 4 million at the end of this year's period. Outstanding borrowers, defined as anyone who has an outstanding loan, increased just 2% year over year to 5.1 million in the quarter. 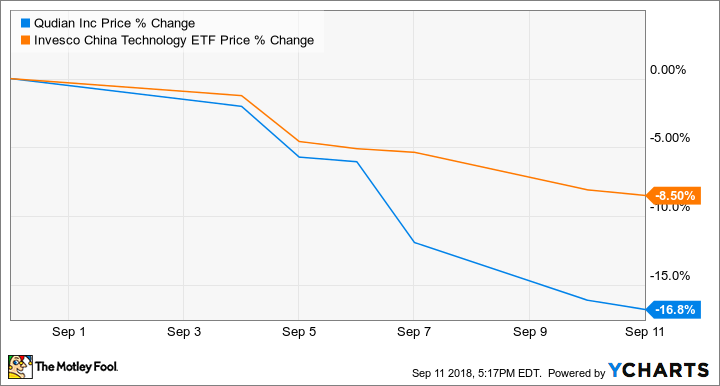 August was a rough month for Qudian shareholders, and September isn't looking much better, with shares down roughly 17% in the month as of this writing. The spate of tough news the company has faced in 2018 probably contributed to the recent sell-offs, but it looks as if the bigger factor is that the Chinese tech sector is moving further into bearish territory. The preceding chart tracks Qudian's performance against the Invesco China Technology ETF, which is a good indicator for the sector's broader performance. The company is now valued at just 4.4 times its trailing earnings and 1.5 times trailing sales, but its murky business outlook means the stock is not as cheap as those metrics might imply.